Most men buy shirts with sleeves that are too short, and jackets with sleeves that are too long. As a result, their shirt cuffs are hidden by their jacket sleeves, creating the impression that they are wearing short-sleeved shirts. If the shirt and jacket have sleeves of the correct lengths at least a half inch (1cm) of the shirt cuff will show. Many men buy shirts with sleeves that are too short. When the sleeves are the right length the cuff covers the wrist and reaches just to the root of the thumb. The sleeve must be long enough to fit well even when the arm is bent, and not just when the hand is hanging down vertically. The cuff should be tight enough to stop it from slipping too far down the hand. The shirt collar must be of such a size that the necktie knot does not lift the tips of the collar away from the shirt breast. The collar tips must stay on the breast of the shirt, even when you turn your head. The tips of a well-cut collar touch the breast of the shirt and will not lift up when you move you head. 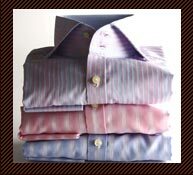 The collars of really good shirts are always cut large enough to fit well, regardless of whether fashion dictates wide or narrow collars. Someone who insists on buying small, narrow collars should not wear heavy Jacquard neckties. The shirt collar must be cut so that the knot sits exactly in the middle of the upper part of the triangle and does not slip down. 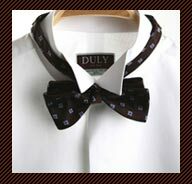 The knot of the necktie must sit exactly in the triangle between the two sides of the collar and stay there. Many men have a habit of not only leaving this button open, but of not even pulling the necktie tight. The shirt collar is too narrow if it is covered at the back of the neck by a well-cut jacket collar. 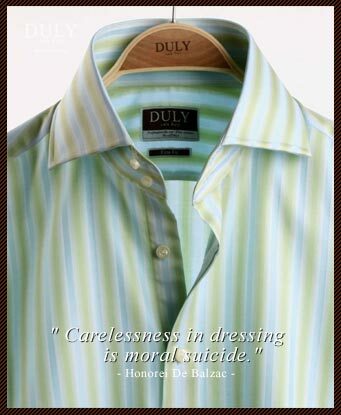 Unfortunately, many manufacturers follow fashion blindly when it comes to the width of the shirt collar. This is particularly important because the necktie can often be seen at the back of the neck if the collar is too narrow, something that is definitely to be avoided. The shirt collar will not be covered by the jacket at the back of the neck if it is the right width, provided the jacket is well cut. If the outer edge of the shirt collar is not covered by the lapel, the collar is usually not cut perfectly. The outer edge of the collar and its tips should just be covered by the lapel of the jacket. Only in this way is perfect harmony created between the lines of the shirt collar, the necktie, and the lapel which encloses them. The cutaway collar generally looks elegant because its outer edge is always covered by the lapel, even if the jacket is less well cut. If you have received this email from your friend and would like to receive emails directly from DULY in the future, please click located on the top.